Lori will be joining me at the hospital next month. Lori Greiner’s travel line, that is. I’ve been using the Weekender Bag for a few months now and I’m simply amazed at how much fits inside this easy to transport little bag. Enough for a 2 night stay in DC, for sure. And there are so many pockets for so much organization, it was simple for me to decide which bag to start packing for hospital stay. The Weekender (mine, of course, is pink) is a 3-piece set: a large wheeled luggage bag with a very sturdy frame, a detachable toiletry roll (with more than ample pockets) and a removable cosmetic case. And then there are the pockets. Oh… my love for pockets. There are pockets within pockets! I counted 10 of them on the luggage bag itself (including 1 clear vinyl on the inside, 3-4on either end, both inside and outside, two on the outside front flap, one inside front flap (which has a handy hanger to keep the flap open).) Plus the cosmetic and toiletry bags both have their pockets. Now when I pack for a weekend (or a hospital stay) I’ll know exactly where everything is. This bag has been fantastic all winter and spring and there is no question: when it comes time to pack for the hospital to have baby #3 (hmmm… that should be soon, shouldn’t it?!) Lori Greiner’s Weekender is the bag I’ll be rolling behind me. The retail price is $103, but the QVC price is only $56.40. If you don’t need the luggage but could use a little organization on your travels, check out this four-piece set of Travel Organizers with a tote. 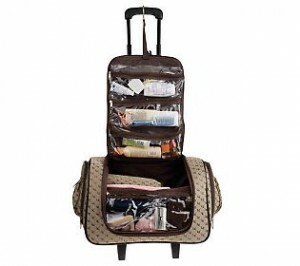 On clearance (also at QVC) for only $29.48, you’ll get a cosmetic organizer, a toiletry organizer, a lingerie organizer, and a jewelry roll that all pack neatly into a 15″x 16″ tote. I don’t recommend carrying the organizers alone, but for easy packing and tucking them into another bag, this is a super value. Now this is practical! I could use one of these for myself… but even better to pack all of the bits and bobs that I need for my little one on any given trip!